This is a versatile chicken dish – it’s low in fat, high in flavour and so easy to make. Preheat oven to 200°C. Line a large baking tray with non-stick baking paper. Combine the ricotta and garlic in a small bowl and season with salt and pepper. 2. Use a sharp knife to cut a deep horizontal slit in the thickest part of each chicken breast to create a pocket. Spoon the ricotta mixture evenly among the pockets and press to enclose. Place the grapes in a 2L (8-cup) capacity rectangular glass or ceramic ovenproof dish. Drizzle over the vinegar and sprinkle with the rosemary. Season with salt and pepper. Toss to combine. Roast in oven for 30 minutes or until the grapes are tender. Meanwhile, heat a large non-stick frying pan over medium-high heat. Spray the breast side of each chicken piece with olive oil spray. Cook the chicken, breast-side down, for 2 minutes or until just golden. Transfer to the lined tray. Bake in oven for 15 minutes or until cooked through. Place the milk in a saucepan and bring to a simmer over medium heat. Reduce heat to low. Gradually add the polenta in a thin, steady stream, stirring constantly. Cook, stirring, for 5 minutes or until mixture thickens and polenta is soft. Season with salt and pepper. Divide the polenta among serving plates. Top with the chicken. Spoon over the grape mixture to serve. 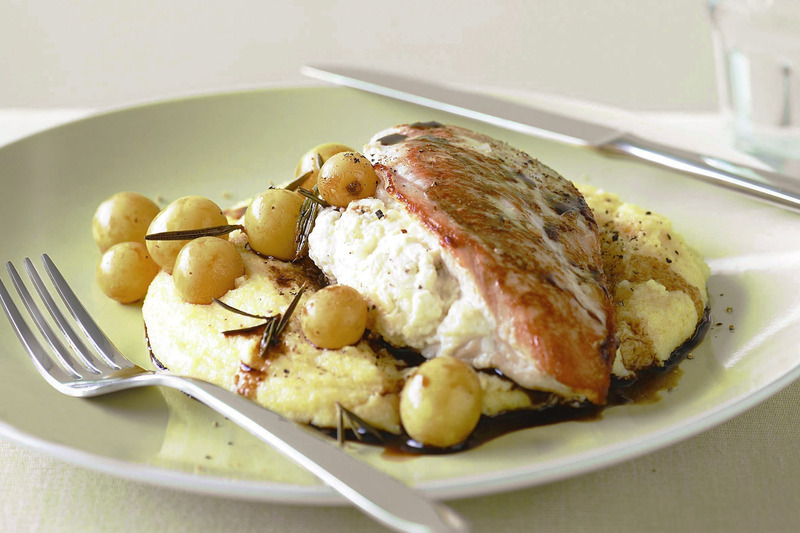 Seedless and sweet, Menindee grapes pack this ricotta-stuffed chicken meal with vitamin C.